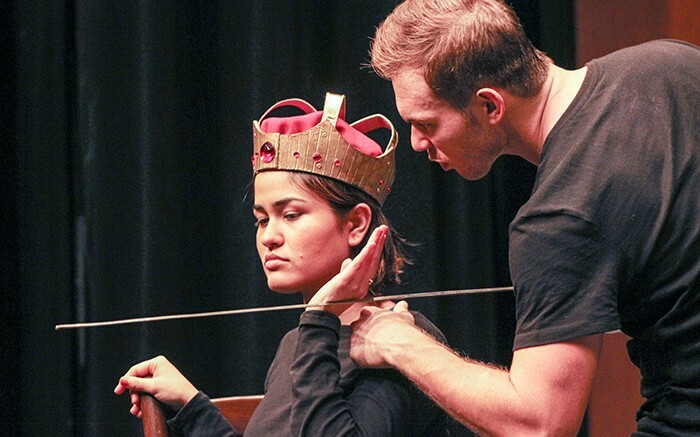 Two actors from Oregon visited American River College to perform an abridged version of Hamlet and lead a workshop for ARC students Tuesday. Eddie Lopez and Susana Batres are professional actors who perform for The Oregon Shakespeare Festival, a theater organization that runs from July through October. Lopez took on the role as Hamlet and Batres played the rest of the cast of characters from the play. While it was originally only performing Shakespeare plays, the festival later began to produce other playwrights’ work. Shakespeare’s Hamlet features a protagonist who finds out that his father was murdered after talking to a ghostly figure who claims to be his father. The actors casts the character Horatio, who Hamlet calls his most trusted friend in the story, as the play’s narrator. Hamlet is one of Shakespeare’s most complex characters, and Lopez asked the audience members if they think that whether or not Hamlet is pretending to be mentally unstable, or if the character becomes mentally unstable after pretending. Most of the audience responded that it thought that Hamlet becomes mentally unstable after pretending to be. “Kind of how he goes back and forth in this antic disposition, as he calls it, it’s super freeing for an actor to play,” Lopez said. Batres said that the appeal to the works of Shakespeare is that they are timeless. The actors lead an acting workshop after the performance, which involved student actors to gather in separate groups to perform tableaus. Student actors were instructed to present scenes in snapshot like sequences, while the remaining actors served as audience members and were told to close their eyes during transitions. Each group was instructed to construct murder scenes inspired by a photo. “It’s great to work on more on Shakespeare because it feels that it is always overdone, until you learn more stuff about Shakespeare, and there is always more to learn about Shakespeare,” ARC student Zach Eckstead said. Be the first to comment on "Actors from the Oregon Shakespeare Festival perform abridged version of Hamlet"